I had problems yesterday sending the email with the photos, everyone in Samoa uses mobiles to text but there is is no broadband coverage anywhere on the island except for internet cafes in the Town, and even that is very slow. I was on Skype for a few minutes and the whole system seems to have crashed!! Today we are meeting Floris' cousin who is a Matai (chief); the only female Matai on the council; and her father who has the oldest planted Cacao in Samoa. We met him briefly this morning for formal introductions and to present our request to meet with him and for him to share the history and his wisdom with growing cacao in Samoa. He accepted the invitation - so tonight we shall present him with our chocolate… and interview him. There is Samoan, which is the first language here and not everyone speaks English and then there is official Samoan that all business and village matters are conducted in. All ceremonies start with Cava and then Koko Samoa. On the way home last night from Apia the capital town, we bought fish - the villagers go out in their canoes and at around 5.00pm and hang their catch up outside their front gate and you just stop and pick the fish you want. Floris kindly gutted the fish (her Mum used to go fishing every day and fish is the key ingredient in the traditional local diet). Then we stuffed the fish with fresh picked chilis, onion, coconut cream, fresh picked lemon grass and garlic. The fish looked like a snapper. 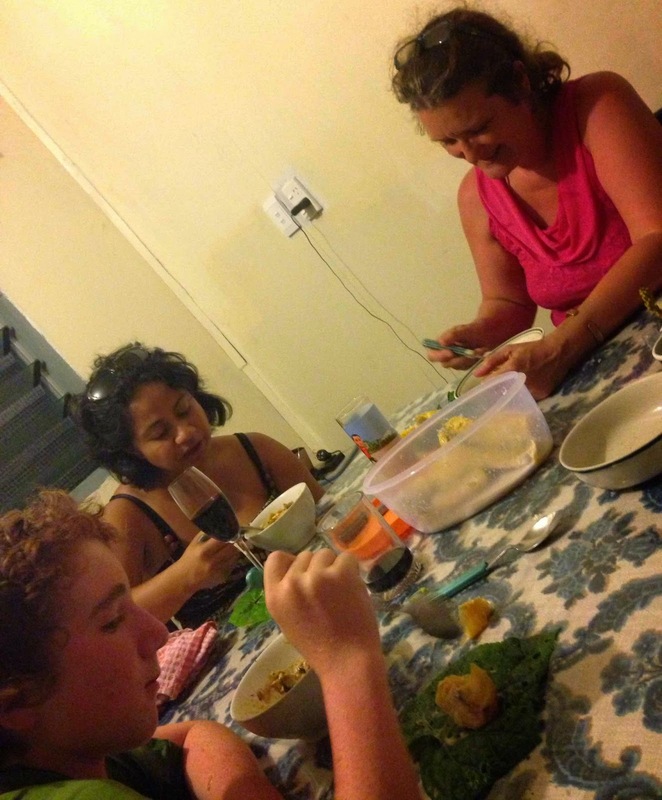 We asked Osho and Caomh to create a salad from foraging in the jungle to go with the fish….Floris suggested wild spinach, grated green pawpaw and coconut.. They created wild spinach, olives, toasted seeds (which we brought) and fresh lime juice. Not bad. Osho kept trying to find spinach that had no holes in it until I told him that the caterpillars always ate the best leaves so trust them… we had very holy spinach salad!!! The fish was stunning, the flavour of such fresh fish baked in banana leaves was mouth watering and Floris cooked green bananas in coconut cream and that was a surprise - a little like Taro but the taste of the cream was perfect with the fish. This morning we had koko esi; cooked pawpaw in coconut cream and grated cacao. It was delicious, especially after a morning out on the plantation. The boys had Skippy Ricies!! Every few hours we join Henry as we turn the fermented beans that are now sun drying. Floris and I need to find an accurate weighing scales so we can weigh the beans to ensure enough moisture has been taken out. 100 beans should on average weigh between 100 - 110grams. As I mentioned before the process here has been very local, just processing for the local market so sun drying was traditionally done over 2 days. There is an international grading system for cacao - three main grades based on flavour, colour (off beans shouldn't be greater then 3%), debris in the beans and dryness (should have 7% moisture content). This batch of beans have been fermented for 6 days which is unusual for the village so it will be interesting to see the result. The tradition is to ferment for four days in baskets woven from banana leaves. 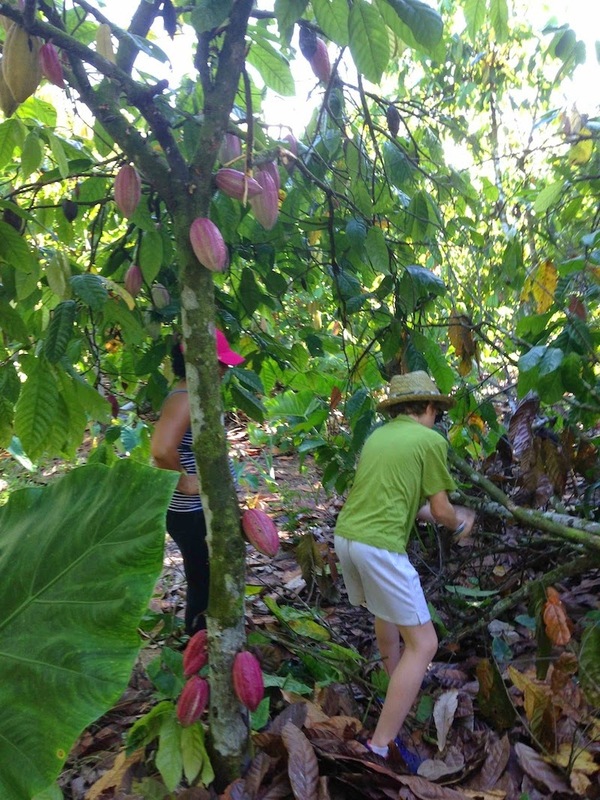 The variety of cacao in the village is Trinitario, which has the most flavour after the rare Criollo. There are three main varieties of beans - Criollo which is the most rare and has he finest complex flavour, but is also very fragile and can easily be wiped out by disease. Then there is Forastero, which was the variety beans grown in Fiji. This variety is the most robust but the mildest in flavour. The third type is Trinitario which is a cross between Criollo and Forastero. It was created in Trinidad in the late 1800's after their fine Criollo crop was wiped out by disease. They didn't want to plant the plain Forastero but needed its robustness so created a new variety by crossing the Criollo with Forastero. The trees are really over grown, have grown too high for full harvesting, due to the farm being left unattended for so many years. The trees are traditionally kept to about 10 metres on a plantation so all pods can be reached but when grown in the wild can grow to over 20 metres. We spent the morning pruning, harvesting and removing dead pods from the tree. The Cacao Tree does not have the ability to drop its own fruit. It is part of its reproduction plan. The tree does not grow well in close proximity to another tree and so its plan is for birds, rats and squirrels to eat the fruit on the tree and to poop the seed out further away!!! And so any pod that has not fully ripened will go black and has to be cleaned off. It does however drop its leaves and naturally created a blanket of mulch that weeds do not grow up through. 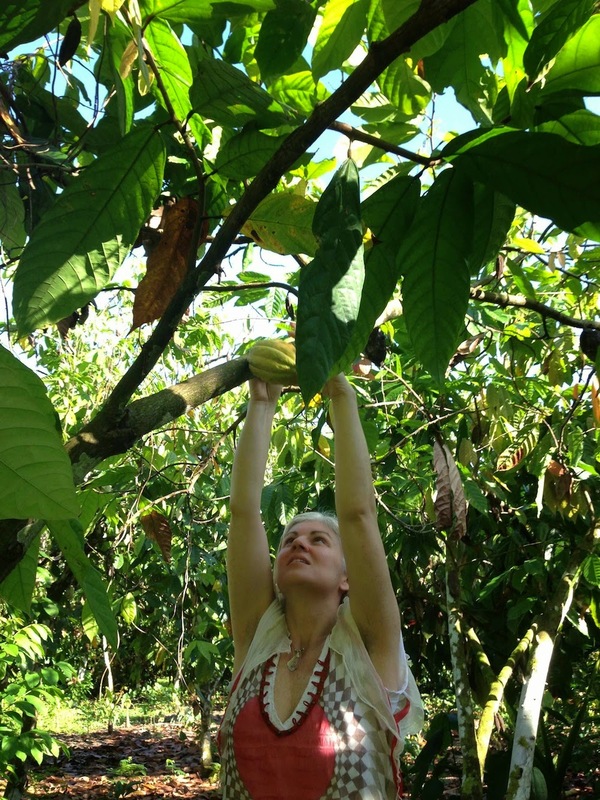 It is such an experience to be in the full process of cacao farming and not just go for a quick visit. The level of appreciation of the work involved is huge now. Farms usually do not have roads through them, and so pods are collected in sacks and carried to the road, some farmers have utes and others carry all the way back to the farm house. The pods are extremely heavy. This is one of the reasons for small farms to have Cacao planted all around the house, for minimal carrying, but on bigger farms it is unavoidable. As harvesting takes place pruning also takes place - if a branch does not have new flowers on it after all pods have been removed, it will be pruned. Once the pods get to the farm house, they are usually left for another few days before they are split open and the fruit and seed are removed. Osho and Caomh got stuck in on the plantation, Osho first filming and then pruning. Debbie loved the pruning but ended up getting a whack in the eye. Osho tripped with his camera at another stage and went flying, is a little bruised but fine and I somehow damaged my wrist using the machete. So we are definitely greenies on the land but loving it. 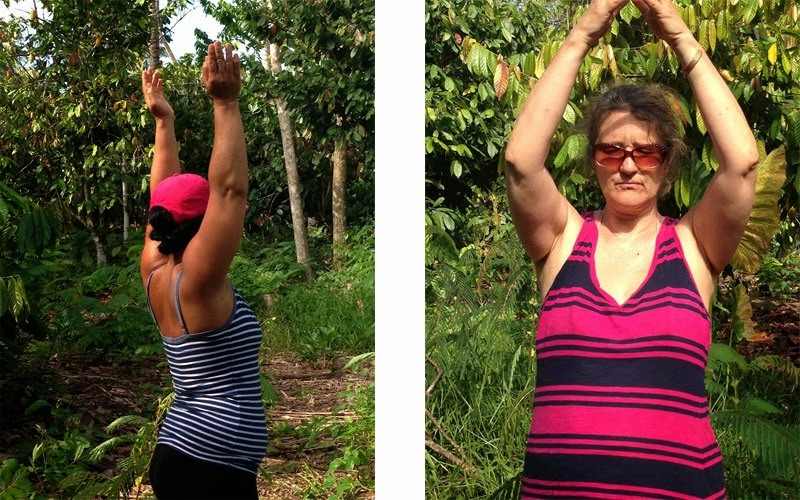 We finished the morning dancing Cosmo Form under the trees. Floris loved it and Debbie is going to teach her part 1 of The Form. Silence and power as everything danced into one. Floris had to sit down as her knowing of her next step flooded through. She has a big job to do here. The first would be a working bee with lots of Chainsaws!!! But not until April as it can get up to 37 degrees from November onwards. Its about 31 degrees now. We arrived to meet Floris's cousin the female Matai and to interview her father Ifo (who has the most knowledge and owns the oldest purest cacao farm in Samoa). I had only discovered yesterday that Floris had actually sent some of her father's beans to us, as she did not have enough on her farm, and so it was an wonderful to be able to present chocolate made from his beans to him. 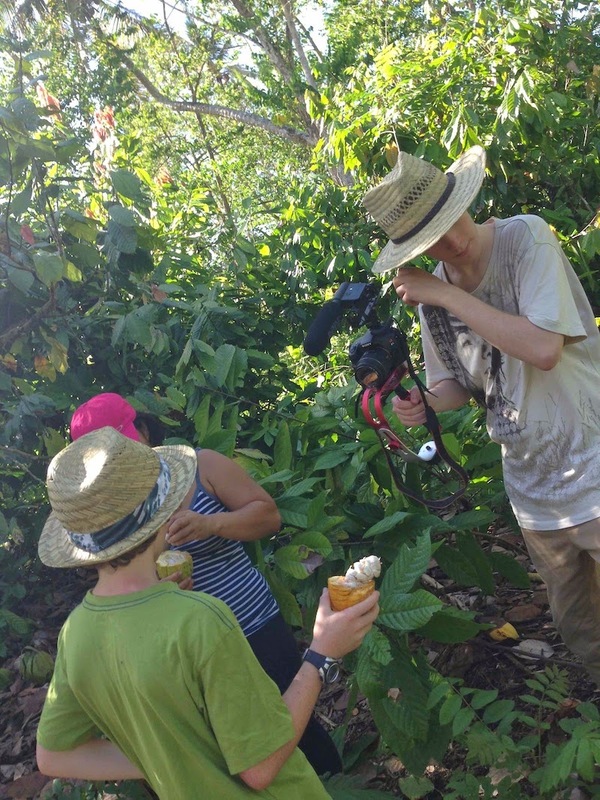 We went under the cacao trees to interview Ifo. He selected the tree to speak at and Osho set up his camera. I presented Ifo with our chocolate made from the beans of his plantation. It is a small farm, unlike Floris', but the trees radiate immense love and care. I presented Ifo with the chocolate and expressed the honour it is to be on his plantation and work with beans from his trees. The interview was in Samoan. He tasted the chocolate and expressed the fineness of his platate with Koko and that he could taste his beans in the chocolate. It was a beautiful interview under the trees. It turns out that contrary to the common belief that Cacao was planted in Samoa in the late 60's it has actually been here since the beginning of the 20th Century. Ifo did not know exactly when it came but it was on his land as a boy and his father taught him how to care and harvest. He has never used any kind of chemical and expressed that this is very important to him in the flavour of the cacao. He went through each step of the harvesting and his communion with the trees and the beans in each step was paramount. No manual or research could capture what is in this mans heart in caring for his trees. He listens, is in tune and understands Koko (I am using the spelling Koko as that it is how spell in Samoa). Fermenting is done in traditional baskets woven from ferns, which are lined with banana leaves. Left for 48 hours, then turned once with a particular technique so that the fermented juice runs out and then rewrapped for another 48 hours. He then tastes a particular part of the fermented fruit to ensure a full fermentation. The beans are then washed and laid out to dry. again for four full sun days. When they are ready he described that the beans start to sing. If they over dry then they become like they are roasted. It gets that hot here and they are dried over volcanic rock so could easily roast!! They are brought inside every night. After we went through the process of harvesting. I invited Debbie and Osho to ask any questions. Debbie asked Ifo if he spoke to his trees. "I thank them for everything they have gifted, I have never had to ask my children in NZ for money, these trees have honoured my family by providing a continual harvest all year round. They too are my children". Then his daughter added laughing, "I also hear him saying to them - you poor trees I don't know who will love you as I do when I am gone"
I asked Ifo how we could honour his chocolate on our packaging, he laughed and asked that we honour Pure Samoan. This is the pure strain of Trinitario that first came to Samoa, but is rare for a farm to only have this strain as other varieties were introduced in the 60's and 70's mainly Melandario which is a variety of Forastero. Then he turned to his daughter, the Matai, and said ask her. As she was speaking and explaining Pure Samoan, Ifo spoke once more and said "Call it my full name." I asked what it meant and did not need to wait for the translation because I already knew! The answer: The Sacred House ...and I experienced The House of God as Ifo was speaking. I so bow down to what is truly here! It was getting dark and it was time to go. I shook Ifo's hand bowed down and kissed it, he in turn kissed my hand. A beautiful invitation to go home and dance The Form.